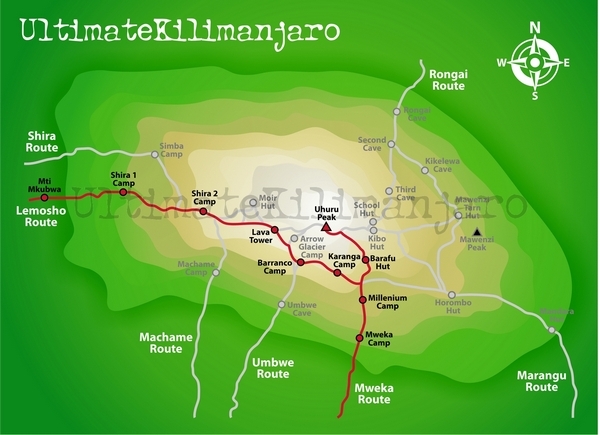 Below is the day by day itinerary for the seven day Lemosho route on Mount Kilimanjaro. The seven day Lemosho route variation is preferred over the six day option because it breaks up day two into two days, providing better acclimatization and a more gradual ascent. On the seven day route, we walk from Forest Camp to Shira Camp 1 on day two, a reasonable altitude gain of 2,000 feet. Then on day three, we continue from Shira Camp 2 to the little used Moir Hut, at 13,800 feet. Overall the exposure to this altitude will help prepare the body for higher altitudes coming on the following days. However, the trek from Barranco to Barafu, followed by the summit day are unchanged from the six day Lemosho variation. This schedule is still very tough, though the extra day on the mountain on the seven day route will help climbers deal with the exhausting itinerary better than those who opted for the six day route.